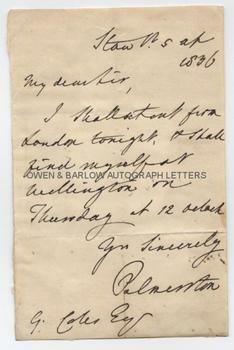 LORD PALMERSTON Autograph Letter Signed. Henry John Temple, 3rd Viscount Palmerston. British Tory and subsequently Whig statesman who was twice Prime Minister (1855-58 and 1859-1865). ALS. 1p. 5th April 1836. To G. Coles, Esq. "I shall start from London tonight, and shall find myself at Wellington on Thursday at 12 o'clock." 8vo. Approx 7 x 4.5 inches. 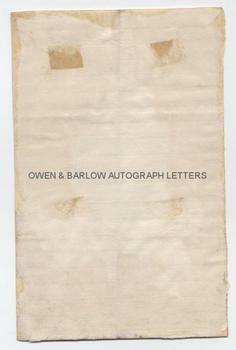 Lacking integral blank leaf and backed onto paper with mounting traces on verso. Very good. At the date of this letter, Lord Palmerston was at the beginning of his long career as one of the most successful Foreign Secretaries Britain ever had. His time in office, as Foreign Secretary and Prime Minister, saw some of the most turbulent times in European and World history and Palmerston is credited with having been the first to practice what came to be known as "gunboat diplomacy". In April 1836 one of the issues that Palmerston was engaged in hotly debating was the question of Russia and its restrictive trade practices which caused it to stop and search ships at the mouth of the Danube and crossing the Black Sea.